You are currently browsing the Suburban Homesteading – Frugal Living blog archives for July, 2013. The more I raise livestock the more I try to use all that the animal provides to me—from the most prime cuts to the less appealing parts. Sometimes this is easier than other times and the idea of eating certain parts less appealing than others. We can all down a T-bone steak or savor a rack of lamb, but what about kidney, heart, tongue, or even brains. Even I have to admit that some of the organ meats are a bit daunting to think about much less prepare and eat. One that isn’t hard at all is duck liver, especially when it comes in the form of Pâté. For me a smooth, rich pâté and a loaf of artisan bread are like milk and cookies; chips and salsa; carrots and dip would be to others. It is food for the Gods, my favorite go to snack food, the perfect road trip food. When I butchered my dozen Peking and Rouen ducks last fall I saved the heart, liver and gizzards, freezing them in small batches for future use. I had (have) no idea what I’ll do with the heart and gizzards, that’s for another adventurous culinary quest, but I knew exactly what I would do with the livers. Make pâté, and make it often. So when our summer concert series started I set out to use my duck livers and dive headlong into the world of homemade pâté. I wanted to cook something I had never cooked before. I wanted to begin exploring cookery of lesser known cuts. I wanted to savor those lush, velvety flavors as we sat under a balmy sky and listened to a rhapsody of song. In preparation for my weeknight pâté making I pulled a package of four livers out of the freezer and let them defrost in the fridge while I was at work. After a bit of research and comparing recipes I chose one by Jacques Pepin, a world renowned chef who likes to keep things simple. Aside from the simplicity of the recipe, the process was short and the reviews, by other intrepid pâté makers, were very positive. So, I gathered together the 7 needed ingredients, plus the defrosted duck liver and set about making my first ever pâté. I rinsed and rough chopped the livers; diced the shallots, crushed the garlic and sipped the Cognac before measuring out the required amount. I used butter because my duck butchering helper chucked the duck fat in the trash bucket before I could tell her to save it. But, no matter, it turned out great anyway. Pâté, as it turns out, is really very easy to make, almost full proof in fact. I screwed up on a few of the measurements because I used more liver than the recipe called for and misread my calculations. But, it still turned out fabulous. Basically, you sauté shallots in duck fat, or in my case butter, add the duck livers, garlic, herbs, salt and pepper then puree it all with Cognac until smooth and creamy. Pop it in the fridge to set, if you can wait that long, and then store it in a lidded container. It doesn’t keep long, but who cares…it won’t last anyway. There you have it… pâté, bread, a hunk of cheese, a bottle of wine and a perfect summer night. What could be more sublime? Now all I have to do is figure out what to do with the lamb liver the butcher sent me. Is there such a thing as lamb liver pâté? The search is on, folks? 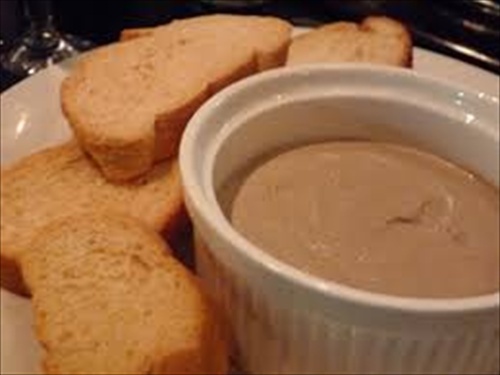 Want to try making your own duck liver Pâté? I highly recommend Jacques Pepin’s simple recipe. Place duck fat in skillet and cook over medium heat for 4 to 5 minutes, until fat has melted and some has browned. Add shallots and cook for about 30-seconds, stirring occasionally. Add liver, herbes de Province, and garlic, and cook over medium heat for about 1-1/2 to 2 minutes, stirring occasionally. Add salt and pepper. Transfer mixture to a blender or food processor, add Cognac and blend until liquefied. If you want a finer texture, press mixture through a strainer with the back of a spoon. Let cool for 1-1/2 hours before covering and refrigerating. When pâté is set, spread on toasted baguette slices. Will keep 3 to 4 days if covered. This recipe makes about ½ cup. I used four livers and it made almost 2 cups. Hens eating their eggs? There is a reason. One of the worst habits a hen can develop is eating eggs, whether your flock is for egg sales or just supplying your family. And, when she gets the taste of eggs it’s hard to stop her without persistence. But, don’t panic because it’s not always necessary to cull the offending egg eater. Egg eating usually starts by accident, when a hen steps on or accidently cracks an egg. She pokes around, tasting something yummy inside and then goes hog wild breaking and eating eggs as soon as they’re laid. Many times the whole flock joins in the feast, leaving few whole eggs for family or farm. Not Enough Calcium. When hens don’t get enough calcium their shells are not strong enough to withstand everyday life in the coop. Even minor bumps or knocks can cause an egg to crack. Commercial poultry feed don’t always give your girls enough of the mineral to produce a strong shell. Supplementing with crushed oyster shells or ground egg shells can help increase the calcium level. That’s right! Eggshells for the egg eater. But, make sure they are crushed or chopped fine so the hens won’t make the connection. Shallow Bedding. To give hens and eggs a good soft place to land make sure there is about 2” to 3” of bedding material, like shavings or straw, in each nesting box. 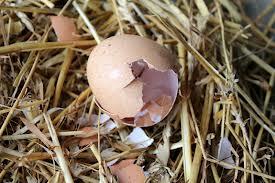 Less bedding means hens are laying eggs on a hard surface, which can cause cracking. I have used both for years and prefer straw in the warmer months because it doesn’t pack down as much. But, in the winter I use a layer of shavings with straw on top, giving the girls added warmth in each box. Be sure to save or compost when you clean your boxes. All that dry matter and manure makes great compost material or side dressing for nitrogen loving plants. Not Enough Nesting Boxes. Your coop should have one nesting box for every four or five hens. They won’t hang a shingle out claiming a specific box as their own and you may find that they use a few of the same boxes, but more boxes gives them room spread out and can cut down on the skirmishes. Broody Hens. When a hen is broody or setting eggs she will stand her ground, trying to keep other hens off the nest. These tussles can cause broken eggs. Egg Collecting Times. Leaving eggs in the nest long after they are laid is an invitation to an egg eater. Eggs should be collected shortly after they are laid, if possible. This has always been a challenge on our farm because by the time hens lay we are off at work or school, leaving collecting until evening. Protein Deficient. Chickens require a high percentage of protein in their diet either from feed or other sources, and the lack of it can cause hens to crave eggs. So…give them what they want! Strange I know, but one source of protein can be eggs. That’s right, eggs. Adding a bit of scrambled eggs to their feed can help fill the protein gap. Lack of Privacy. Or, in this case “out of sight, out of mind”. If hens can’t see the eggs they are less likely to explore the nest. Draping the front of the nesting boxes can help. A few other reasons hens will eat eggs is boredom and a lack of things to do. Give your hens a place to roost outside where they can watch the world, piles of leaves to scratch in provide hours of amusement, and hanging treats in a tree to occupy them. Playing tricks on your hens can also help stop existing egg eaters. Replace eggs with “fake” eggs like plastic, wood or ceramic, golf balls, or ping pong balls; anything small and round. When your hens go to peck these “eggs” they won’t break, nor will they find anything tasty inside. Blow out a real chicken egg and refill it with something that won’t taste good like mustard or hot sauce. They’ll get the message that eggs are not good. Hang curtains in front of nesting boxes to block the egg eater’s view. If they can’t see the eggs they won’t eat the eggs. With a little creativity and trickery you can work your hens out of eating eggs instead of culling them. Every so often I go on a rampage of frugality. It’s more like a feeling of sickness, a sickness of spending money, sick of the cost of things, sick of pulling out my wallet everywhere I turn, sick of how a dollar doesn’t go as far as it use to. Just plain sick. This past week has been one of those times as the cost gas, water and food increasing almost on a daily basis fills my subconscious. On the way home from work I swung by the library to peruse their daily used book sale to see if I could find any interesting title additions to my growing library. As I walked the stacks those money infused thoughts crept to the forefront. It drew me to think how and when and where money flitters away. It’s not a great amount, mind you. I’m already a fairly frugal, penny pinching saver, always trying to find new ways to spend less on what the farm and I need. As I drew my hand over the books looking for titles that would interest me it came to me…for a buck I could buy a book, a book that would educate me or entertain me. I stood there staring, thinking really, about how many things I have or could buy with a buck. It was amazing to me that in a short period of time I could list more that a dozen things I have bought that were only a buck. Or, 1-1/2 pounds of chicken quarters, for a buck. Then there was the thrift store sale where I bought a new pair of shorts and a few more clay pots for vegetable or flower starts, for a buck. During a trip to town running errands for work I bought an iced tea to stave off the heat…for a buck. At a garage sale I bought a galvanized water trough, for a buck. On Craigslist, I bought iris bulbs, for my ever expanding flower garden, two bags for a buck. I can also buy two stamps, a fat-quarter of sale quilt fabric, salt licks for rabbits, a scoop of grit for chickens, and a few dog treats, for a buck. At the library that day I bought a 4-part mini-series, for a buck. 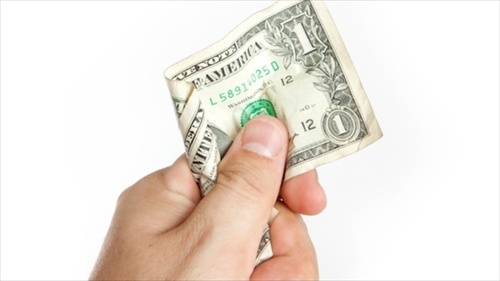 It was proof positive that the dollar has more buying power than I sometimes think. It was nice to sit and reflect on how many things can (or have) been purchased for a dollar. The more I reflected, the more my frugal rampage dissipated, until finally it disappeared all together. Funny how some worries retreat as fast as they come on. What can you buy for a buck? It’s out there ya know. We only have to look.